Luminescent shades are produced in our exclusive formula to produce a silky consistency. Apply dry like an eye shadow for soft shimmer. For opaque, paint-like colors apply with water. Colors will blend on the skin. Seal with LiquiSet or Final Seal. 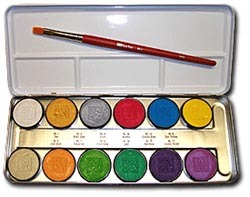 Professional metal palette with brush included. Colors: Ice, Aztec Gold, Silver, Azalea, Cosmic Blue, Sun Iced Gold, Tangerine, Chartreuse, Jade, Royal Purple, Amethyst.